A planning template is a plan that is pre-populated with regularly used content, from which you can start a new plan. Templates are designed to save you time so don't have to start from a blank slate every time you want to create a plan. On your Open plans page, tap Create a plan. Select a template from the list shown, and then tap Start plan. 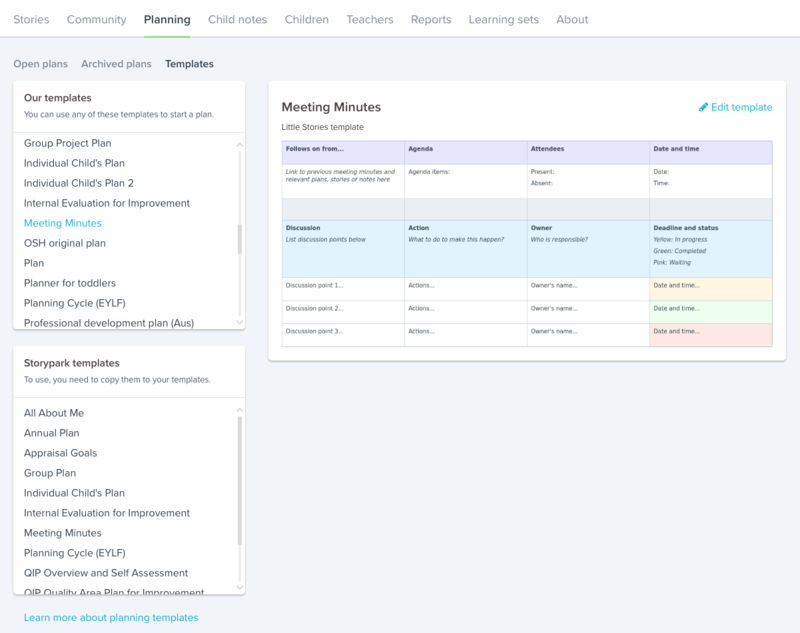 If for example, you have a fortnightly staff meeting at the beginning of each planning cycle, you can simply tap Create a plan and select Meeting minutes from the list of templates shown. 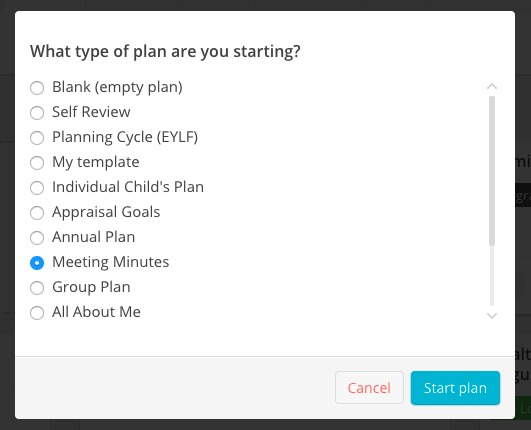 Once you tap 'Start plan' this will begin a new plan based on your Meeting minutes template which you can begin filling out. Give your new plan a name, eg. 'Staff meeting 29 Feb 17' to differentiate it from your other meeting minutes plans, and when you finish your meeting, tap 'Save and exit'. Your new plan will be listed in your Open plans area. If ever you want to see all your meeting minutes, go to your Open plans or Archived plans and simply filter by your 'Meeting' category. You will then only see those plans on the page. Learn more about ordering and filtering plans. To find your master set of templates, go to the Planning tab on your service's profile page, and tap on 'Templates'. On the left hand side of the screen you'll see two lists, 'Our templates' (templates you can start plans from), and 'Storypark templates' (a set of example templates to start you off). On the right-hand side you'll see a preview of the selected plan. You can edit, delete and create plans from any templates that are listed under 'Our templates'. This is a list that is shared by all teachers and rooms in your service. If any teacher from any room adds, edits or deletes a template, these changes will be reflected across all rooms and for all teachers. Note: Each room can also see this set of templates, however if children who are not in your room have been added to one of the templates, then that template will not appear in the list when you start a plan from that room. This means that if you wish to have room-specific templates (and you want to add children to the templates) then you need to make sure that you only add children from your room to them. When you first start using Planning, you'll see a list of Storypark's 12 example templates. In order to use any of the Storypark templates you need to first add them to your templates. In most cases, when you first visit this page, these will already have been added – you can use, edit or delete these if you wish. Don't feel like you need to use any of these if they don't suit your needs – this list is to show you what's possible and to give you some inspiration for creating your own. 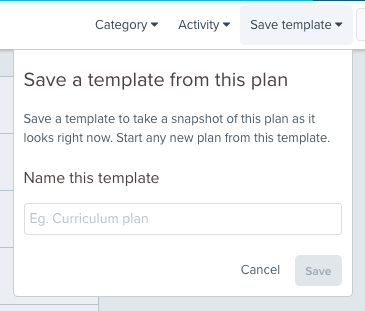 The template will now appear under 'Our templates' and you'll be able to edit, delete and create plans from it. This will open up the template in a new tab so you can edit or delete it. You'll see a blue panel above the plan that says You're editing the template '___' and a Rename option. You cannot save Share settings in a template, you will need to choose who you want to share each plan within the plan itself, not the template. You can change anything you like in a template, including the category and any headings, children and content within the plan. Once you tap 'Save and exit' those changes will be reflected in the updated template. Simply tap 'Rename' in the blue panel, and enter a new name when prompted. If you don't need a template anymore, simply open the template and at the top of the screen tap 'Delete'. Be careful when deleting custom templates as once they're deleted they are gone. If you delete a Storypark template however, you can simply recopy it back to your templates. Your planning area will become much more useful once you begin creating your own planning templates. 1. Begin by starting a new plan. 2. Add any headers, children and content that you would like to appear in each new plan you create from this template. We'd recommend starting by keeping it simple and just adding a few headers. 3. Once your template is ready, tap Save template in the menu bar and give your new template a name. This will take a kind of a snapshot of your plan and then it will be listed on your service's Templates page under 'Our templates'. We'd love to see what kind of templates you create. If you're happy sharing your creations with Storypark, and even the wider community, please get in touch at hello@storypark.com. Of course, any information relating to individuals will be removed to respect their privacy.